Norfolk Coastal Partnership: Guardian Newspaper » The Wash and North Norfolk Marine Partnership. The Norfolk Coast Partnership are good friends of The Wash and North Norfolk Marine Partnership, working closely together to protect local nature and culture. The Norfolk Coast Partnership are the management group for the ‘Norfolk Coast Area of Outstanding Natural Beauty’, a designated site situated landward of the high-tide line that was established to conserve and enhance the natural beauty of the area, the distinctive landscape character, biodiversity and geodiversity, historic and cultural environment. 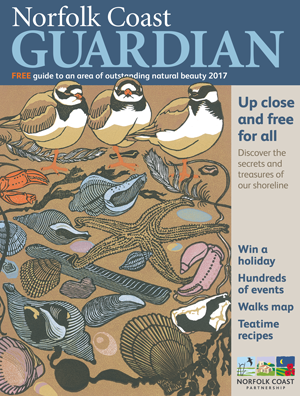 The Norfolk Coast Partnership publish a fascinating annual newspaper called The Guardian. This year The Wash and North Norfolk Marine Partnership wrote an article about the marine protected areas along this beautiful coast and how regulators and local people work in partnership to protect it.